There are some makeup artists who I just connect with immediately. 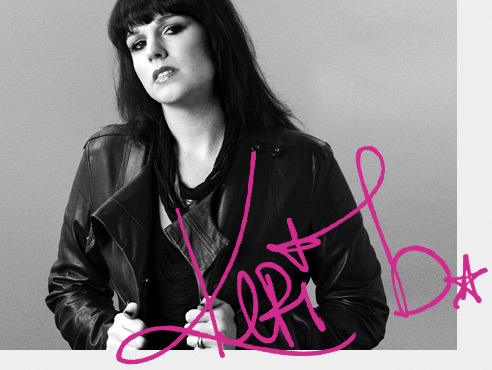 Keri Blair, one of the Senior Makeup Artists for M.A.C, is one of them. After corresponding for months over Twitter, we finally met this past Fashion Week -- and I'm so glad we did! Keri's unbelievable knowledge of all things M.A.C, not to mention a wealth of fabulous makeup tips and a delightfully effervescent personality, make her one of my favorite people to talk to. Over Pinkberry a few weeks ago (one of our shared obsessions), she sat down with me to share how she got started in the makeup business, some of her favorite products and where she gets her inspiration. Read on to find out more. Is there a makeup artist that has stood out in your career? Hands down, Val Garland. One of my biggest makeup heroes from a fashion and beauty perspective. I don’t know where she gets her inspiration from, or how she sees the makeup that she sees, but the way that she works and having the opportunity to work with her has been probably one of the most ... I’m not anywhere the makeup artist that she is, I’m not even close. But there’s something about her approach to makeup that I get, and that I aspire to be like. I feel like everything she does is so magical. And she will teach you. I just had the most amazing opportunity to work with Rick Baker. Watching someone who understands the anatomy of the face the way he does, moreso than just bone structure, but actually the muscles and the fiber tissue and all that stuff underneath the skin. Watching someone be able to recreate that paint, the striations with a brush and a Paintstick, is mind-blowing. Because he does prosthetic makeup and special effects makeup, he knows the skull inside and out, he knows how the muscles lay across it. That is somebody who can really do unbelievable things ... talk about the power of makeup, it was life-changing! He’s really gracious and generous. We have a relationship with these artists that are the best in the industry. I’m on Twitter with Sam Fine, who although does a very different style of makeup than I do, I’ve learned so much from him. We have a relationship! That says a lot about how mac treats not only their staff and their senior artists, but the professionals we work with, and the kind of relationships we can build through the people who work with us. What do you like about Twitter for your work life? How has it helped to bring you forward? What’s been interesting about Twitter is the exposure that you get. M.A.C really started as a company that was like Faberge. I truly feel that social media, especially Twitter, is a way to get one message out to a lot of people in a very fast way. It’s a modernization of that Faberge organics idea. I’ve been able to connect with professional makeup artists, with beauty bloggers, and not only build relationships with them, but connecting with makeup artists who have questions and need guidance. I’m a very fit person, I love to work out. A lot of these women who have special needs -- waterproof, long-wearing, what should I try? -- it gives us as a brand a voice in cyberspace that they can come to and they can trust. A lot of people know who I am through Twitter! Someone who doesn’t go on Facebook or go to master classes, the everyday layman can see stuff from backstage! I think that M.A.C has opened a window, or a peephole, or a wormhole! -- to a whole generation of people who live in middle America and aren’t ever going to actually be exposed to working backstage. And suddenly it’s a click away on YouTube! That’s pretty magical! When I was a kid, there were three makeup artists -- Kevyn Aucoin, Wayne Bandy and Linda Mason, and that was pretty much it! They were doing everything, they would do the whole show by themselves! Now we have this whole united front, this whole industry. We try really hard to be equal opportunists and really give the brand a really great voice. I work for those followers, I try to interact and be timely in my responses and really showcase what the brand has to offer, even if it’s just free shipping on our website. I’ve gotten to meet people like you and other bloggers! It’s a good place to feed all your neuroses and meet so many great people and reconnect with people. Even celebrities you get to work on, they’re on Twitter and you can give them a shoutout! It’s such a fun, fascinating art, and one thing I will say is I feel like over the past 10 years, makeup artistry is a very viable, very lucrative career. Whether that’s working at the counter, assisting someone or really freelancing and getting out there. Even being a bridal makeup artist, it may not be as exciting as you wish it would be but you can make a lot of money and really meet some amazing people. It’s amazing to be part of such a great field that’s so creative and so beauty oriented. I think women just want to feel good about themselves, and I’m so blessed and lucky that I have the opportunity to make women feel that way. Check back tomorrow for the next installment of my interview with Keri Blair. To follow her on Twitter, click here. I love these interviews! can't wait for the next part. Thank you so much for sharing.